AShop is an artist collective specializing in urban arts, artistic event activations and muralism. The primary objective is to produce large scale public art that speaks and appeals to the population while communicating the artistic direction of each of the participating creatives. While each member of the group has a unique artistic journey, they come together through their passion for urban beautification. This cooperative spirit generates an exceptional artistic atmosphere, which is the basis of their creative process. Each project is approached as a custom collaboration between all members, from conceptualization to final execution, with everyone bringing their ideas, styles, techniques, and experience. It is this collaborative process that makes each tailor-made creation a direct expression of the members of the collective, and the result is innovative projects, dynamic, authentic and reflective of the community and context that they are presented within. 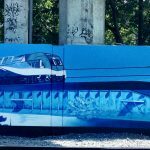 This artwork was commissioned by the AMT from the A’Shop artists’ collective to reduce risks of accidents due to intrusion by graffiti artists onto the train tracks. The “controlled” fresco projects demonstrate that this type of initiative is appreciated and respected by young graffiti artists. 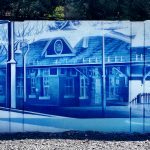 Using the AMT logo’s blue and the theme of the railway, this artwork 30 metres long by 3.5 metres high spreads across the three parts of the concrete structure erected near the train tracks. 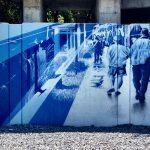 It includes a tribute to the history of the railway in Griffintown and the Montréal West train station, and references to the movements of users and the trajectory of the commuter train.